More than 10 years later, this advice is no longer “sufficient” in order to reach the top positions on Google. Historically, the people within the company responsible for content marketing focused on developing unique content, scaling it by creating new pages centered on distinct keywords related to their industry. This, in 2015, is definitely not the strategy that will generate new clients with long-term success. As can be seen, that which is marked in blue is the only original content that can be found (unfortunately it is not of much use). Also, the map in the left margin does not have any function that allows someone to interact with it, and finally, the pictures of the different tourist points of the city are not unique. Perhaps many will think that just by copying what TripAdvisor is doing will be sufficient in order to position themselves on various search engines through content marketing in order to generate new clients. But there is nothing further from the truth. TripAdvisor has millions of references over a period of 15 years, since its creation in Feb. 2000 by Stephen Kaufer. Competing against them with the same strategy is impossible. In order to be successful in this new age of content marketing, one should aim at what AirBnB is doing to confront a giant like CraigsList. This article will first show the precise comparison of two similar contents, and then secondly, analyze in detail the 5 factors which make the difference. The first characteristic is the exclusivity of the content. 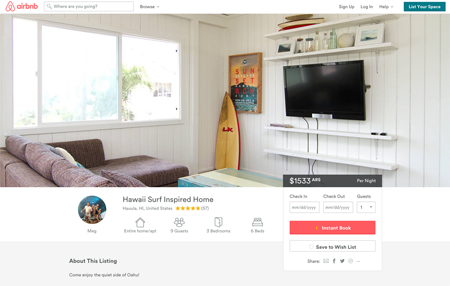 In the previous comparison, one can see how AirBnb’s own staff went personally with their photographer and took various high-quality and personalized professional pictures of the property for rent. In this specific case, seriousness and security are transmitted to those seeking to rent, but also it is a sign of exclusivity for search engines like Bing, Yahoo, and even more importantly: Google. All of these will prioritize this content in their organic ranking for their users. No one will want to see the same pictures, the same content, and much less the same comments on different sites around the Web. This doesn't mean unique content, which has already been a basic requirement since 2005. What value refers to is in the ability to give the user precise information that gives the exact answer to that which they were searching for at the moment of doing a search on Google. 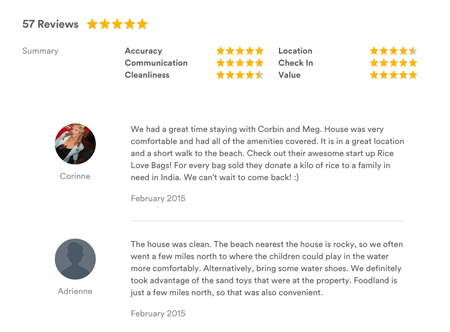 In this example, it can be seen that AirBnb is offering users over 50 opinions of other clients that already stayed in this property. These are verified references that generate value so as to make the right decision, in a timely manner. 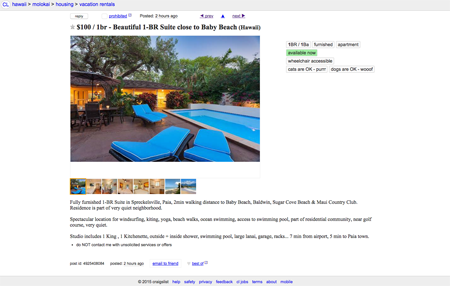 Whereas in comparison, Craigslist does not offer even one reference, thus forcing the user to basically make a blind decision. 3) It should be useful. Additionally, the user that eventually sees the content should find the use that they were looking for, without having to go to another site as well (everything in one place). For example, on Craigslist, one is left with the remaining steps of contacting the owner and carrying out the payment for the rent. Whereas AirBnb takes care of the “dangerous” and “bothersome” steps for the client, in a simple and fast manner (including guarantees). This point refers to making a difference between the rest of the content that can be found on the Web. And this difference is transmitted through added value (not content). In each industry in which a strategy for content marketing is developed, there can be differences and changes, and thus one should find an innovative offering. 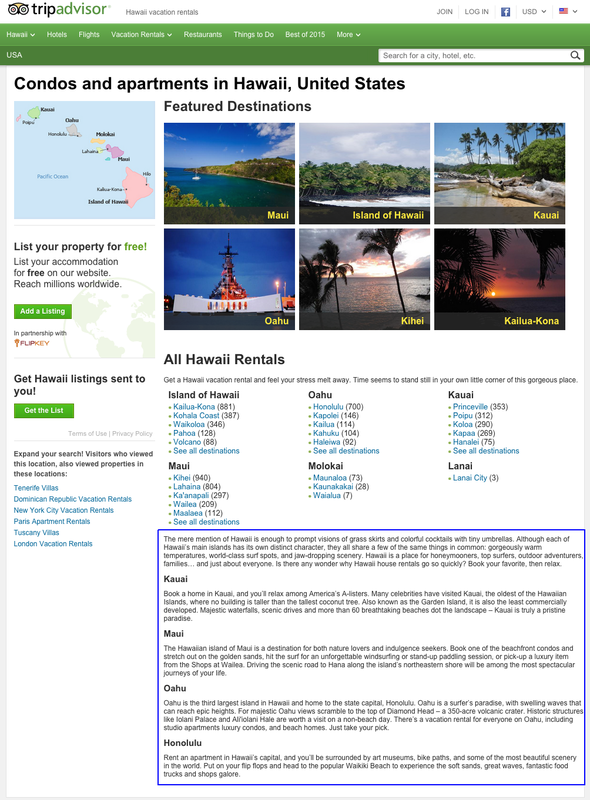 In this specific case, AirBnb is the only platform for temporary rentals that also provides information about the owner. One can analyze their complete profile, from their social networking sites to knowing their identification document, which was previously verified by the company. All of this value is available on their platform. Finally, the content should have a simple design, especially so that it can be used from any device (notebook, tablet or mobile phone). This last point is no small detail. Those users that have an excellent experience using their computer, but from their mobile phone cannot use the exact same content with the same ease, will have a direct impact which will show on our ranking on the search engines. And Google is already working on this as shown by this video by John Mueller, Webmaster Trends Analyst for Google Switzerland. In conclusion, these five points previously stated are from now on the minimal requirements for carrying out high quality-content marketing with success in the long run. About the author: Cristian Ángel is Director of Online Marketing for CotizadorSeguros in Mexico. Previously worked for HP, IBM, and Intel as a PHP programmer for Latin America. In his free time he enjoys traveling throughout Argentina and Brazil.